The Sony consoles have long been a solid destination point for JRPGs. While the genre gets represented on the Microsoft and Nintendo systems as well as PCs, many of the more niche titles just seem more at home on Sony. As such, I have been personally waiting for some solid JRPGs to find their way to the PlayStation 4, and am happy to say that Omega Quintet not only fills that need, but does so very, very well. If you are looking for more serious fare, something like Final Fantasy Type-0 HD would probably better suit your interests. If you want a high level of combat strategy, then an SRPG like Natural Doctrine might be more your style. However, if lots of humor, several different systems at play at once, turn-based combat and plenty of idol satire are more to your liking? Then Omega Quintet is right up your alley. The focus on idol culture is definitely strange here, and I am sure that the bright visuals and short skirted characters will come across as either too cutesy for some gamers or too exploitative for others. There are certainly cases to be made on both fronts, but being dismissive of Omega Quintet due to those reasons would be a shame, because you would miss out on a well-designed JRPG that provides plenty of good mechanics with an interesting look at idol culture at the same time. The idol culture scene in Japan is an interesting thing. It certainly makes money and is insanely popular, almost to a cult-like fault in some corners. Young women (really more like girls) are marketed and sexed up in the process, appreciated more for what they represent at times than any actual singing performances. It is more about putting on a show - a show that people will flock to with regularity. Here Omega Quintet takes a few pokes at the culture, but never really comes down on it completely. You are primarily seeing the game through the eyes of a young man named Takt. He does not particularly get or care about the culture. He is unimpressed by it, though he does understand that it is important. Why? 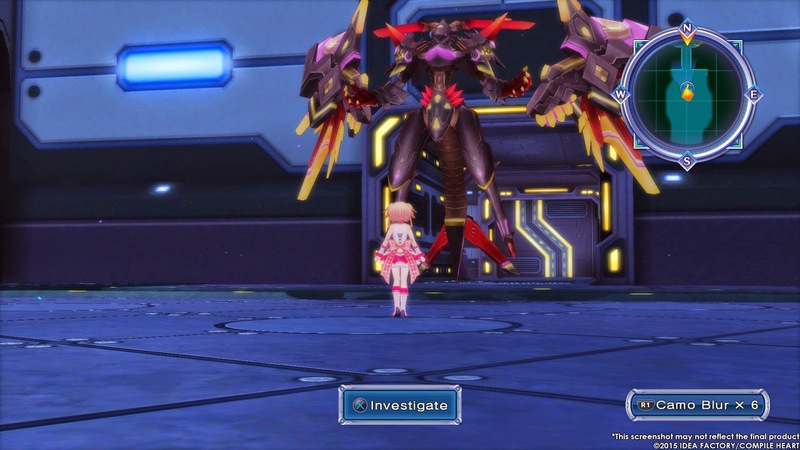 Because the world of Omega Quintet is one besieged by a demonic power called the Blare. The Blare is slowly transforming the world, corrupting it and the people occupying it. The Blare has been expanding, its only real opposition coming from Verse Maidens. These young women appear in very limited numbers, but have the ability to destroy the Blare through their music, dance and fighting prowess. It is a ridiculous premise to be sure, but it works in large part because it is both unique but also in many ways relatable to those familiar with idol culture. Here men flock to the big screen to watch these heroines battle the Blare on their behalf. It becomes a show - a presentation. Fan support is paramount in sustaining these girls who are dressed up and trained to literally put on the performances of their lives in order to help protect society. The story stars with Momoko, a popular Verse Maiden who has been carrying the weight of her responsibilities far longer than most. She is stubborn, proud and does not want to hand over her responsibilities to other, in part due to her pride and in part because she is worried that the newcomers will fail to hold up their end of the bargain. Takt and his childhood Otoha inadvertently get embroiled in things and it is discovered that Otoha herself has incredible potential as a Verse Maiden. However, she lacks confidence at times and essentially is prone to what would amount to stage fright when the stakes are highest, often relying on Takt to lend moral support. Other characters are introduced as well along the way to help form the team that Takt is reluctantly managing. The girls are the star of the show naturally, but Takt helps to provide a bit of a counter balance to their personalities. He understands that there is importance to the job that the Verse Maidens have to perform, but he just refuses to get swept up into it all. On the flip side of the coin are a cast of over-the-top fans who insert themselves into the story along the way from time to time. 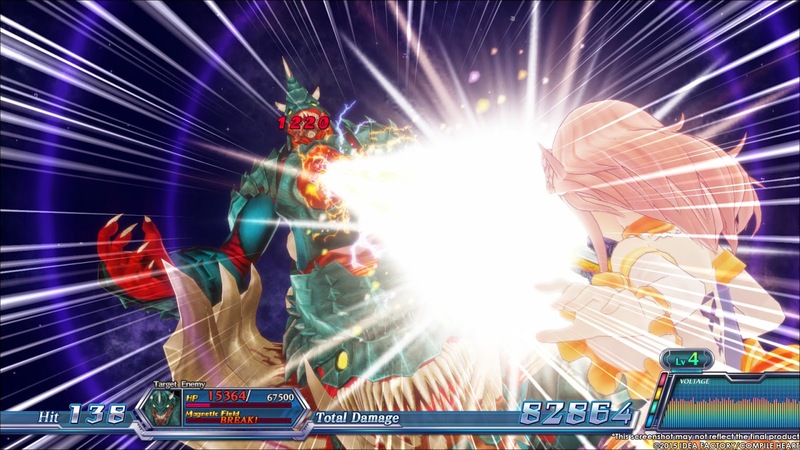 Moving away from the overall story, Omega Quintet still offers solid JRPG mechanics. Combat is fast and turn-based. While those things do not always go together, you can hold down a trigger to speed through combat, handy if you're simply grinding away. Experience leads to level-ups, which help to unlock skills from an album. Items can be deconstructed for what equates to money. There is an items shop. There is a makeup room for changing character appearances, There is a staging area for setting up song and dance routines (serving as a sort of mini-game within the game that actually offers a good deal of content for those inclined to delve into it), equipment upgrades, affection levels and more. 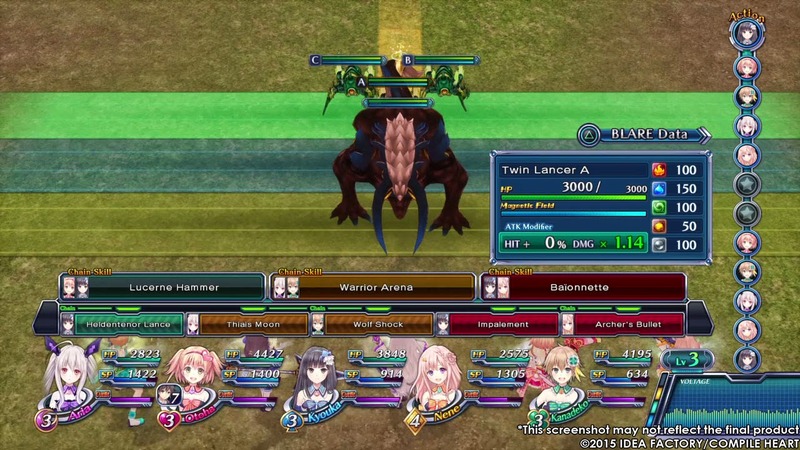 All in all, Omega Quintet has a fairly meaty set of gameplay options to keep gamers busy with. Visually and in terms of tone, Omega Quintet immediately reminded me of the Hyperdimension series. Instead of focusing on console wars, it takes a long look at the world of pop idols, but all in all there is a very familiar feel to it. While Takt serves as our portal into the game, the vast majority of the characters are made up of cute girls in short skirts with plenty of fan service for anime fans. I enjoyed how self-aware the developers were in making the game as well. When I first took control of my character, I was making the usual adjustments to camera sensitivity and movement inversions and spun the camera around. As I neared ground level, Momoko turned around, put her knees together and used her hands to keep the front of her skirt down while admonishing me for peeking. Of course when they run and jump, you see what you see which is cartoon legs basically, but it was a funny moment that reflects some of the humor that shows up throughout the game. After playing a game like Dragon Age: Inquisition on my PlayStation 4, it is safe to say that Omega Quintet is not pushing the hardware anywhere close to its limits. 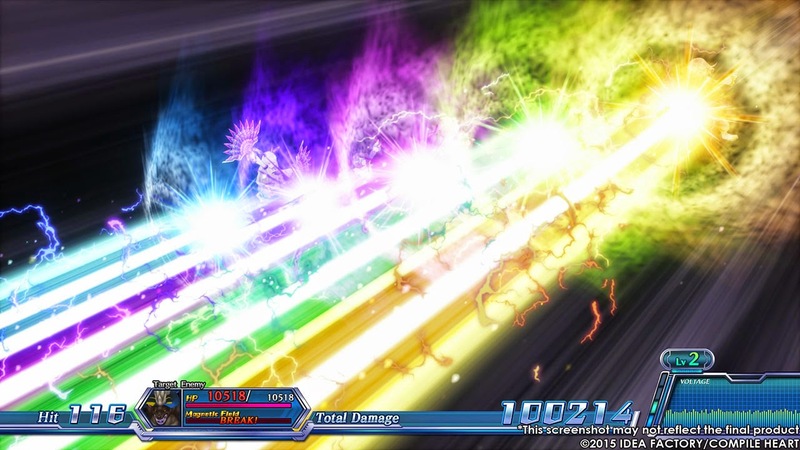 That being said, visually it is bright and colorful (almost to a fault at times, with plenty of confetti-like visuals that sometimes seem bright just for the sake of being bright) and the framerate holds up very solidly. I personally appreciated the stable framerate after having played similar games over the years like Hyperdimension and Time and Eternity where the framerate was all over the map to the point of almost being dizzying now and then. It was also nice to see that Omega Quintet had both English and Japanese voice acting. Omega Quintet offers something the PS4 has been lacking on the JRPG front, and that alone will no doubt pique some interest. Thankfully it is more than just cute girls and fan service, and actually provides some interesting satire to complement several strong gaming mechanics as well. All in all, I would say Omega Quintet is a very strong start for Idea Factory and Compile Heart on the PlayStation 4 and I am looking forward to more.